Taylor Power Service Centers have over $3,000,000 in parts inventories specifically for generators, transfer switches and related generator components. Our Technicians have an inventory of common repair parts easily accessible when responding to emergency calls. 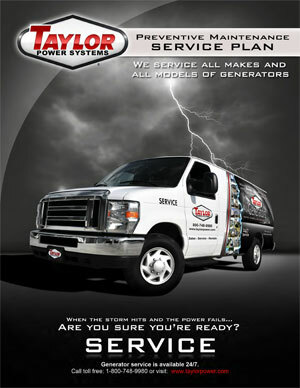 In addition to parts for Taylor generators, we stock parts that are common to most all makes and models of generators. These are not just maintenance parts. We stock complete control panels, circuit boards, voltage regulators and other commonly used repair parts. Our parts inventories are shared among our 5 Service Centers and 35 service vehicles. Taylor Power also has a dealer network available to ensure next day delivery and potentially same day delivery in emergency situations. We have almost 30 years of building inventory history on generator and transfer switch parts that need to be stocked to assure maximum uptime for emergency generator systems. 40+ point inspection of the most critical generator parts.